Masterclass here from the GOAT has he dispatched Tomas Berdych 6-4 6-0 to make swift progress into tomorrow's Semi Final. There's no way of describing it other than a complete demolition job from the Swiss and his game was working like a well oiled machine from the get go; moving well, serve clicking and his ground game on song off both wings. The numbers don't often lie and Fed reeled off 21 winners, won 88% of his first serve points and didn't face a single break points during the 68-minute encounter. Awesome! Federer won the toss and elected to receive. Tactical decision most likely to try force an early break but Berdych held to 30 to kick things off. Roger then fired down an impressive love hold to level followed by another in game 4 to make it 2 all. In game 5 Berdych hit 3 double faults but saved one break point to hold. Roger again held comfortably and in the Czech's next service game broke to love to take a 4-3 lead. That was soon 5-3 and after Berdych held his next service game the Swiss served it out to 30 to take the opener 6-4. A clinical set really and Roger barely put a foot wrong on serve dropping only 5 points. Into set 2 and things went from bad to worse for Berdych as he was broken immediately before Roger consolidated to take a 2-0 lead. One break is always recoverable at this level but when the Czech fired down a double fault at 30-40 in his next service game the match was all but over. 3-0 soon became 4-0 and we even got a genius point at 30-30 in the fifth game as Roger broke for the third time in a row before serving out the match to love. Clinic. A peRFect performance from start to finish from Roger here and one of those matches where pretty much everything he touched turned to gold. Berdych has had success against Fed before with big flat hitting from the baseline but Roger just unsettled him by controlling play with his forehand and giving Tomas plenty of variation. Air on the forehand, net approaches, taking pace off, you name it he tried it and Berdych was deprived of the rhythm he needs. That ultimately led to the Czech over hitting, mistiming and looking for shots that weren't there. 21 winners from Fed coupled with 21 errors from Berdych, huge difference. As a Fed-fan it's been great to see his level elevate round by round after scratchy matches against Schwartzman and Seppi but now we're into the business end of the tournaments things are coming together nicely and he surely has a realistic shot of making the final if the trend continues. I thought he moved great too which is key, he said in an earlier presser he felt like he wasn't quite judging how to get to the ball yet but today he was spot on, the running cross court forehand especially moved him from defence to offence a number of times in the blink of an eye. As for Berdych he was never at the races in this one, he got off to an ok start in the first 4 games but the error count began to creep up on him and he struggled to really win any of the important points. Looked like he was struggling for timing on quite a lot of the shots either looking rushed or not making the right sort of the connection with the ball. All to do with how Fed was hitting the ball with such confidence or his game not quite on? Probably the former which exacerbated the latter. Next up is Milos Raonic who was the surprise victor against Rafael Nadal in the Quarter Final. Even though I picked Raonic to take out Nadal in my Indian Wells draw post I wasn't 100% sure it would happen but the Canadian pulled off the biggest win of his career. On a side note my tennis tipping line has been bang in form this week with Tomic to beat Ferrer, Robredo to beat Dimitrov and Raonic to beat Nadal all predicted before a single ball had been struck. Hope you guys got on it and congratulations if I made you a millionaire. Raonic is streets ahead of his contemporaries like Dimitrov in terms of match & mental toughness and he saved 3 match points in the second set tie break and some break points in the decider to take it 7-5. Nadal actually played at a pretty high level too, winning 10 more points than Raonic in the match but just didn't make the big points like he usually does. Missed a few forehands and seemingly got a bit tight in the breakers. I don't think it's a terrible loss for him though, looks like his game and movement is improving back to a high level and he will no doubt be terrorising people on the clay courts quite soon. It is however a disappointing loss for fans who wanted a Fedal encounter, I think Roger would have had a good chance to get a win here and he clearly thought so too based on his post match interview where he said he'd rather play Rafa. But instead he'll face Raonic who he leads 8-1 in the H2H and beat recently in the Brisbane final for his 1000th match victory. I think Roger holds a fairly sizeable advantage against Raonic here and he's always done well against big servers in Indian Wells; beating Karlovic, Isner and Anderson on this surface in years gone by. Raonic is coming in off a gruelling encounter too which lasted 3 hours, quite a short turn around and his style of tennis revolves heavily around running around his backhand to hit inside out forehands. If you're just a step slow then that can really throw your game off as you struggle to get your free out from under the ball. Perhaps the only negative for Fed is that he might be slightly less motivated as no doubt he'll have expected Rafa to come through if he had to pick. But I think that's probably unlikely, he's been around long enough to know no matches are set in stone and it's happened plenty times before on hard courts where Fed is in form and seeded to meet Rafa but Spaniard doesn't hold his end of the bargain up. Right on the money from the first point and played a great match. Zero energy wasted, confidence rising. Allez! Amazing performance from Roger! Everything was working on Federer’s side and Tomas never had a chance to get back in the game which was a pleasure to watch. I hope Roger beats Raonic in two and saves some energy for the final. An upset is always a chance but i think Roger is the favourite to win and will need another almost perfect match in a potential 2014 final rematch against Nole. Yeah Fed really moved well. Cant believe I missed his match, set my alarm wrongly 3am match time is killer for me. Great performance by Roger almost god-like mode, hope he will be sharp against Raonic. Didn’t expect Raonic to pull off a W against Nadal. Shocker Dippy 🙁 buy a new alarm. Emerson what are you doing up at 4am?? awesome performance, no more to say. Just watch and admire! Credit to Raonic for hanging tough, massively improved game. Woke up just in time to catch the match! His backhand down-the-line was superb today. It was a very decisive shot in the rallies, produced winners, wrongfooted Berdych constantly and set up easy put aways. Shame we can’t witness another Fedal encounter, I thought Roger’s chances were pretty decent this time round, so its a little disappointing. I’d hoped Raonic would push the match into a deciding set so Nadal would be more fatigued, but had no idea he would even break serve to win the whole thing. Unbelivable result! Yeah BHDTL was great, so was CC forehand, Berdych was having to move too much which he doesn’t like. Nothing better than Roger serving bagels to a top 10 player. Raonic must be a bit exhausted. Rafa and Roger in a 24 hour period might just be too much for him although he is playing great tennis. Might drag Roger to 3 sets but don’t see him winning. Fed’s bagel record is crazy against top 10 players. Thanks for your spot-on write-up, Jonathan. What a night! Not sure you noticed that on quite a few occasions, Roger attacked Berdych’s FH side relentlessly, which caught Berdych and (me as well) by surprise. That sent Berdych scrambling all over the court, getting no rhythm at all. Roger handled some of his flat-hitting very nicely. Roger’s play, every aspect of it, clicked beautifully. What a display! Against Milos, Roger will need to do the same – variety and make Milos run around and bend over as much as possible. Once he is huffing and puffing, we know what will happen. Agreed on Raonic, make it physical and test his legs. Berdych’s serve just wasn’t working at ALL, and his feet seemed to weigh a hundred pounds. Still he managed some nice gets, some good shots – but the guy on the other side of the net was lightning-quick & just got to everything. So a Berdych far from his best vs. a Federer who was firign on all cylinders. I really can’t think of a thing I wish Roger had done differently. Granted, the match as a whole wasn’t super high quality because both guys weren’t at their best, but – I wished for luminous tennis, and by golly, I got it. MAESTRO. In the other QF, Rafa looking scary good too, just at the appropriate moment, really moving incredibly well, amazing gets…. I was sure he was going to win…. and then Milos! Sticking with him, not panicking, upping his level…granted, looked like Rafa started to tire a bit too, wasn’t rushing back & forth with quite the gusto he had been. I almost think this has been good practice for Milos to play Fed, giving him some time with his best game. Hopefully it will just make it a really good match. And it’s not even the final yet! Think he has changed ball toss? Looks to be lower than before, he used to chuck it up into the clouds, never served well on a windy day because of it. I think the match was high quality from both, first 5 games were close then Fed just pulled away, Berdych had to try find winners from bad positions. I saw some of Ndal and his movement was looking great, missed some FH though and Raonic took advantage. Rao should have won the tie break about 10 times over so glad he finally managed it and didn’t let it slip. Oh hey Thinker, we’re telling the same thing LOL! Nice stat Thinker – only to be expected from the Maestro! Web editor for ATP I think that guy so always quick fire with the stats and has some really interesting ones. Fed the bagel king. Staying on the same topic, is there any way to find out how many bagels Roger has served against all opponents? I’m pretty sure he is the greatest baker of all time! Got this stat from @VIBHUISM on twitter. This was Roger’s 97th bagel served in his entire career. I think it will actually be more as Vibhu’s database doesn’t include a lot of matches. I remember earlier this year when we were discussing quickest matches, Fed defeat Golovanov in 32 minutes at the Kremlin Cup in 2002, and that wasn’t in his database. That match also included a bagel. see what you can find at tennisabstract.com – there are all kinds of contortions you can run through there. It was 37 minutes Jonathan ! And I verified this on tennisabstract.com ! Great website as Thinker pointed out ! Obliterates…lol love the title, Jonathan. “Masterclass here from the GOAT”, “a peRFect performance from start to finish” – Yes indeed, nothing more to say. Your prediction has been so far pretty good, hah? Actually I picked Rao to kill Rafa for the Tiger too but now oddly I feel sorry Fedal didn’t happen. Yeah crazy how many times Fed has bagelled these guys, a guy like Berdych serving 130mph can’t hold serve in a set. Congratulations on your predictions Jonathan! It’s amazing. Hopefully Roger can carry this form into the semi. I was hoping the Raonic-Nadal match would go to length so I was cheering for Milos all along. Towards the end I suddenly realised perhaps Nadal would actually make an easier opponent for Roger this time? Anyway I thought the outcome of the two quarters today is the best a Federer fan could have asked for. Onwards and upwards Roger! Hi Jonathan, with your predictions, don’t forget us and at least share the winning occasion with us, if you win millions from bookies. 🙂 . The bagel stat is crazy indeed ! He has bagelled all members of the Big 4 ! His personal bagel record is crazy too ! A single bagel in the last 12 years ! As for Raonic, I think he will surely take a set off Roger in a tiebreak perhaps but not more. One should not forget that he is 2015’s second worst returner behind John Isner winning just 11 % of return games. Doesn’t sound good for him against Federer. Even Nadal said Raonic will have a tough time handling Fed’s service games. Fed absolutely GOATing it out there !! Yeah Fed’s serve has been great this week again, gets a ton of work on it. He hit one against Sock that was like a curve ball, yet it was still 113mph. Crazy. Is that serve visible on any highlight reel ? Yeah, good predictions Jonathan. Actually I did predict a Raonic win over Nadal, but should have listened to you, as others went sadly awry! Sublime Federer – just exquisite. Berdy’s serve took a dive, but, like you, I do think this was down to how Feds played. Berdy looked completely discombobulated at the end. Kudos to Raonic who hung in and kept his cool big time. Nadal is looking more like his old self, but I was disappointed as I thought Feds would have had a real chance for a win against him this time. Now they’ll probably meet in a clay SF…bah! Yeah Raonic must surely have covered close to 2KM in his match. Maybe more. He also knows he has to do well here as not going to Miami so points mean prizes here folks! I think Muzza cld push Novak as Novak has had a lot of time off but Muzza has played a bunch of no bodies really and Nivak always a step up. We shall see! Djokeray is hard to call but will surely be boring as usual. Hey, Johnathan! Nice writing to a perfect match from the Maestro, it was so pleasure to watch him play so freely and loosely. I was thinking throughout the match “God, I wish he played every math so loosely like that cause I feel like he becomes nervous sometimes even before the match starts”, but he’s human after all, right? I think beating Nadal from a set down and saving match points is pretty big. Dunno the stats but how many times has Nadal lost when having match points? Youssef, you have a point. But Nadal is a three time champion here, and he has virtually owned Raonic (just one set in their previous five appearances). Against Federer, his game matches up better. Their games have been close, lots of tight sets. And, as Jonathan pointed out, it’s very rare to save match points against Nadal, then go on to win it. Yeah Youssef, I was thinking the same thing. Raonic over Fed is his biggest win. I’ve said many times, Raonic is very motivated to rise to the top one day. He believes he can get there, so it makes him more dangerous. Never thought I’d agree and prefer a Fedal semi. But there you go. I really enjoyed watching Fed destroy Berdych. Sweet win. Funny Sid, I caught a bit of Luby talking about Raonic win over Nadal, and he mentioned his win in 2010 – his birthday as it happens. Asked about R’s chances against Feds – difficult, you never know what’s coming next; he’s got all the shots, and uses them; Nadal is much more predictable! That made my day! He is inarguably, the most one dimensional multi slam champion (at least 6 slams or more). And I’m basing it off the type of slams he has won; 9-2-2-1 (Paris-London-New York-Melbourne. Sampras, who was a pure serve and volleyer, would be a close second with a 7-5-2-0 record, and the only reason is the lack of a final appearance in Paris. 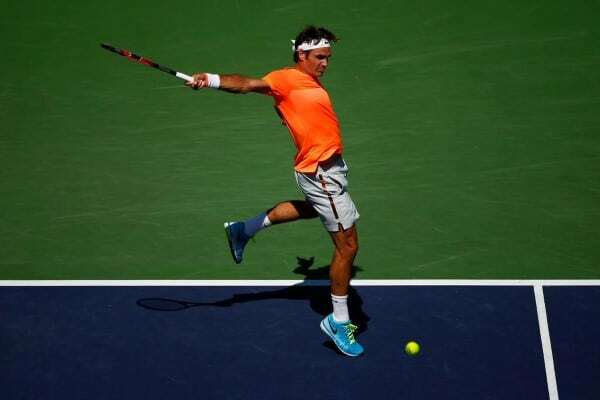 Federer, without a doubt has the best balance; 7-5-4-1. Three different slams, at least four times. Yeah, I was sorta rooting for Nadal too (even though I hated Fedal lately) cause Raonic’s matches are so boring! He’s not bad for the sport as he upsets top guys sometimes and is different to all those pushers and grinders. And Fed and Ljubicic were good friends on the tour. Join the choir and celebrate Roger’s peRFect victory versus Tomas. I agree also, that Milos’ win yesterday to be even bigger than the one at Paris, as Roger clearly was tired then, and Rafa getting up to level. Maybe luck was also smiling more to Milos. And of course tuning in at the wish for Roger to win in 2. I think he probably does it, he is just in momentum now. Jonathan, I wanted to rate Fed with maximum stars, clicking at the 5. at it’s ultimo right – and rating postulates me having rated him 3.9! There is no possibility of undo??? ?